Oxford Sensors Ltd (OSL), Bicester (UK) has announced the release of a new fully integrated system for tandem or triple submerged arc welding, with particular applications on spiral pipe mills. A completely new weld head design which is easy to set up and adjust, and which integrates up to three torches together with flux delivery and recovery, video camera and laser seam tracking. Modular design for ease of using the key components in different applications. The new head has already been installed on several pipe mill locations. For spiral pipe offline ID welding, it can be mounted on a new OSL compact boom-end frame incorporating fully integrated horizontal and vertical slides with space for up to three wire feeders. For spiral pipe OD welding or other similar applications, the new head can be mounted on an OSL slide assembly together with up to three wire feeders for single, tandem or triple arc operation. A new integrated control system allows all parts of the system operation to be controlled from a single location. 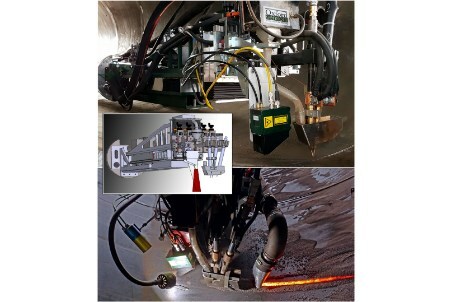 The new control system can be used for simultaneous control of ID and OD weld heads for spiral pipe offline welding from a single operator station. The new system includes weld control and is based on a network architecture, allowing it to be easily used with welding power sources from leading manufacturers.